Introducing Eye-Pal, Where A Picture Is Worth A Thousand Words! In this edition of the EyePod Technocast, Flying Blind, LLC’s founder, Larry Lewis, discusses the entire product line of Massachusetts-based ABISee (http://www.abisee.com), the creators of an entire product portfolio designed to provide audio, low vision, and tactile access to hardcopy print. Optical Character Recognition, or OCR Solutions have been available to vision impaired customers for over 30 years, but ABISee is the first company to combine state-of-the-art mainstream hardware with software know-how to produce a complete range of products for print-impaired individuals of all ages. Mr. Lewis demonstrates the Eye-Pal, an OCR solution designed to interact with a PC. 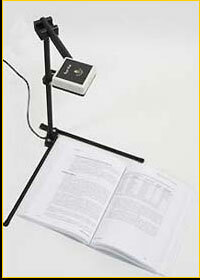 A camera mounted on a specially designed, collapsible stand is connected via USB to a PC whereby the user may capture images of a variety of hardcopy materials and then read the contents of those materials on their PC. Lewis describes how he uses this solution in a variety of settings, and provides suggestions for how to best optimize such an innovative approach to accessing print in a variety of settings. Flying Blind, LLC is pleased to announce that we will now be offering the entire line of ABISee OCR Solutions. For more information on which ABISee OCR product might be right for you, please e-mail OCR@flying-blind.com or call +1 (216) 381-8107.